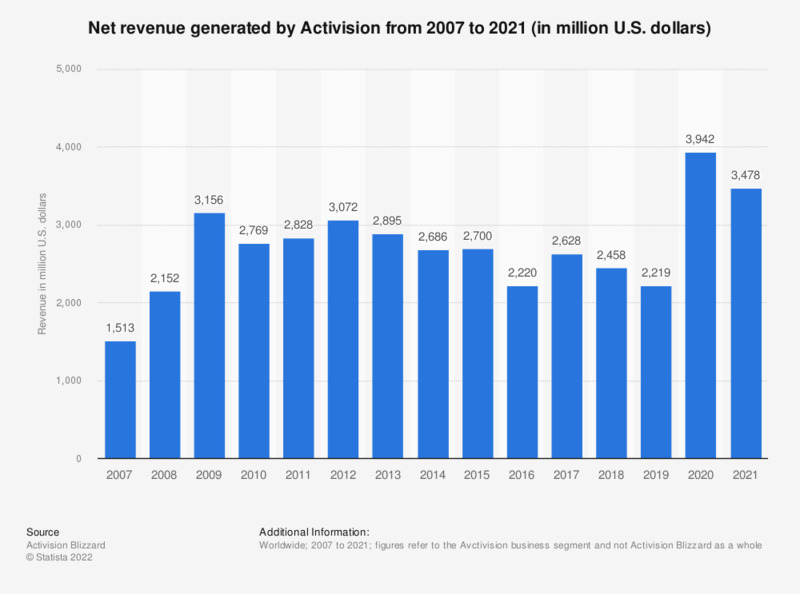 This timeline shows Activision's net revenue from 2007 to 2018. Activision is a segment of parent company Activision Blizzard. In 2018, Activision generated a total of 2.46 billion U.S. dollars in revenue, which was an decrease from the 2.63 billion U.S. dollars generated in the previous year. Activision, Inc. (NASDAQ: ATVI) is a publisher and manufacturer of computer games based in Santa Monica, California, USA. The company is part of the Activision Blizzard group and has offices in Canada, Great Britain, Ireland, France, Germany, Japan, Australia, Scandinavia and the Netherlands. Figures for the period between 2007 and 2012 come from Activision Blizzard's earlier financial releases.